An old Devon legend says that the tiny white 'thunderflowers' that sometimes grow on the thatched cottage roofs around this ancient landscape, can ward off both lightning and witchcraft. Thunderflower Gin is a small-batch gin with enough character to see off any approaching storms or spells. 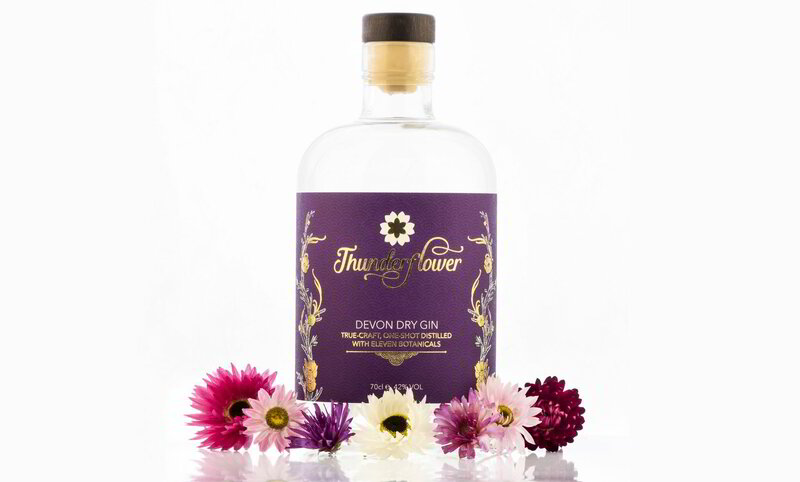 Thunderflower Gin is made in the London Dry style at our nano-distillery in Teignmouth, Devon. We use a traditional ‘one-shot’ distillation run where our 11 botanicals are extracted by vapour infusion only. Only the best cut makes it to the bottle with nothing added to the final spirit except distilled spring water. The Gin is allowed to ‘polish’ for a week to maximise the flavour before being filtered and bottled. The result is a unique Dry Gin with spice, herbaceous and earth notes of our botanical selection creating a complex and enjoyable flavour profile. We make Thunderflower Gin in small batches of 100 bottles - we keep one bottle for our ourselves and the rest is for you. Juniper, coriander, green cardamom, black cardamom, pink peppercorns, liquorice, angelica, elderflower, sage, cassia amongst others. NOTE: Delivery will require a signature from an over 18 – we are unable to leave a package (even in a ‘safe place’) without a signature.